Projectplace by Planview is a project collaboration solution that brings teams together to improve collaboration and get things done. 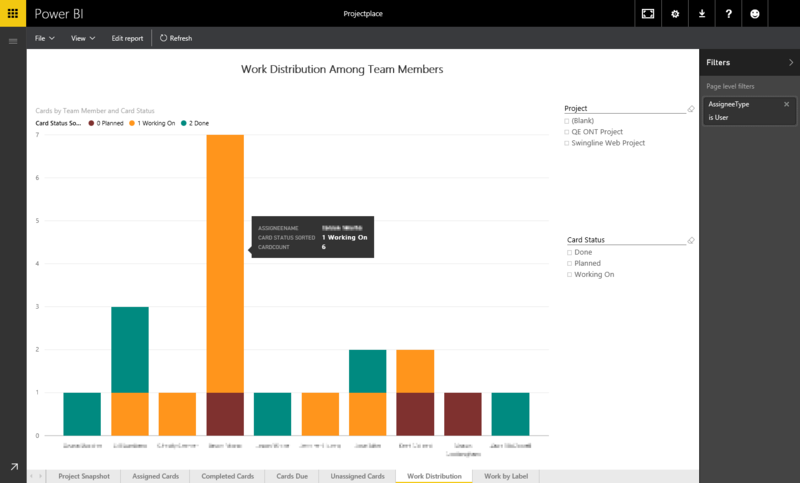 With the Projectplace content pack, you can visualize your project data in entirely new ways directly in Power BI. The out-of-box reports and dashboard provide key project statistics, allow you to visualize progress, find bottlenecks, who your most active team members are, and identify at-risk activities across projects. This post will provide an overview on how the Power BI content pack helps users visualize and draw insights from Projectplace data. For additional details on how to get started, please see the our help page. After connecting to your Projectplace account, your data will begin loading into Power BI. Once the content pack is loaded, you can begin interacting with any of the out of box content such as the dashboard or reports. Clicking on the tiles will drill into the seven page report built on top of the data set. For example, the Work Distribution Among Team Members tile leads to a report that allows you to cross filter and slice the visual by project or status. You can hover over any of the visualizations to see additional details about that specific data point. You can also leverage the filters in the report by opening the filter pane on the right. You can also switch to Edit Mode, to view all of the tables and fields that are included in the dataset. You can add filters, rearrange or modify existing visuals, and create new visualizations. You can also try asking a question of your data, such as “show total planned cards” or “cards and card status by project in a stacked bar chart”. You can also open the Fields and Visualizations panes on the right hand side to see the fields being used in the answer or to further customize your result. You can pin any of the visualizations back to the dashboard to further customize it. You can pin a visualization by hovering over it and selecting the pin icon. On the dashboard you can edit the size, location, and presence of each tile or visualization. This will allows you to tailor the reports and dashboard to your unique needs. After you initially import the data, the dashboard, reports and data set will continue to update daily. You can control the refresh schedule on the data set as well. 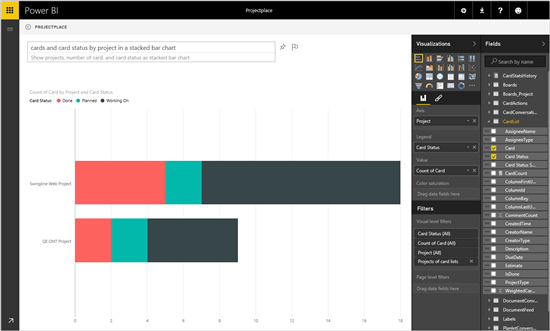 With the Projectplace content pack for Power BI, you can use the initial set of metrics and insights to continue exploring your data even further.